Above: Slickepott's Pam Lamont and Betty Acre Farm's Aissa O'Neil talked up their products at the Pure Catskills booth at a New York City trade show on Monday afternoon. Photos by Jennifer Strom. For three days this week, you could sample Slickepott sweets and Catskill Food Co. sausage from Delhi, Catskill Provisions honey from Long Eddy and sweet Belgian waffles from Pika’s Farm Table in Lake Katrine, all in the same room. Granted, it was a giant room: Those were just a few of the vendors who made the trek downstate to represent the Catskills food, farm and restaurant scene at the International Restaurant and Foodservice Show of New York, an annual trade show held in the Jacob Javits Convention Center in Manhattan. The trade show marked a leap forward for Pure Catskills, the Watershed Agricultural Council’s local-food initiative. This was the first year the organization hosted a booth at the expo, inviting a rotating roster of its members to staff the table and serve samples, said Pure Catskills communications director Tara Collins. On Tuesday, Betty Acres Farm owner Aissa O’Neil and Slickepott’s Pam Lamont garnered rave reviews of their cheese, chocolate and caramel sauce. Visitors gobbled up the offerings: Catskill Provisions proprietor Claire Marin said she ran out of supplies the first day. Above: Catskill Provisions owner Claire Marin offers samples of raw honey, chocolate truffles and whisky from her Sullivan County company. Some Catskills food purveyors have been using the trade show to generate business for several years. Across the aisle from the Pure Catskills booth, Pika’s Farm Table owners Pika and Luc Roels handed out bites of Belgian waffles and talked up their ready-to-eat goods such as quiche and risotto cakes. This was the third year the couple has attended the show, which has proved fruitful in generating big-city customers such as Fresh Direct, the home-delivery grocery service, Luc Roels said. Above: Pika and Luc Roels. The Catskills booths were part of the Pride of NY pavilion showcasing food and beverages produced within the Empire State; other pavilions featured foods from Japan and emerging restaurant trends. 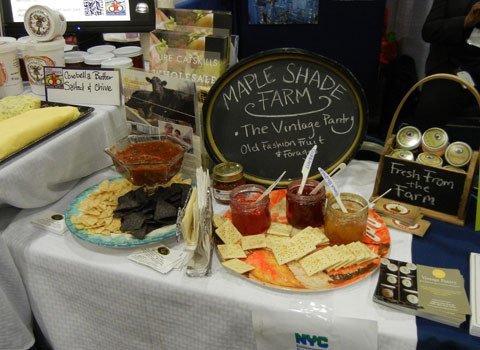 In a section dedicated to government agencies and other organizations, the New York City Department of Enviromental Protection (DEP) booth also offered a variety of edibles produced within the watershed, such as Cowbella butter and Maple Shade Farm jams. Charles Sturcken, the DEP's economic development director, said he was thrilled to have local foods at his table and the Pure Catskills booth across the way. “I’ve been wanting to make this connection for a long time,” he said. Below: Cowbella butter and yogurt and Maple Shade Farm jam on display at the DEP's booth.